The PD Warriors encompass a strong and spirited exercise group and an adaptive dance group that both run through Spaulding Rehab in Medford. PD warriors exercise class has been going strong 2 years and Adaptive Dance has been running PD for a year and a half. 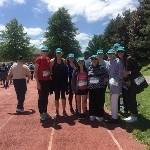 We hope you and your family members will join our team on the track or in spirit! Please consider donating to the APDA, which provides information, education, and support to those touched by Parkinson disease in our community and fund scientific research into the causes, prevention, treatments and ultimately the cure. Specific to exercise, the APDA puts out free exercise publications for people with PD, keeps up to date listings of local exercise classes, and runs a free exercise hotline for people with PD.